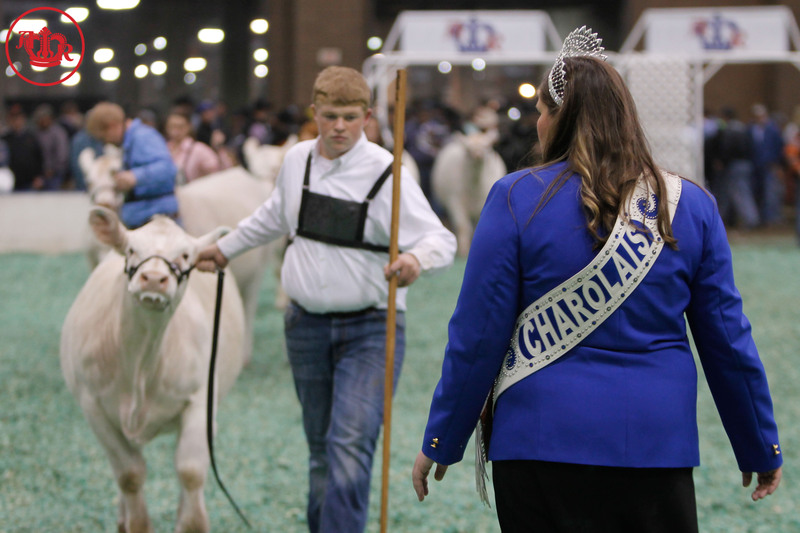 The 2015 American Royal Charolais Show was a competitive one. The morning started off with junior exhibitors filling the ring as they vied for the title of of Grand Champion Charolais Junior Heifer. Judge Harlan Yocham of Saupulpa, Oklahoma, selected Kalli Ellis of La Ward, Texas, as the Grand Champion Charolais Junior Heifer and Trey Conley of Clarksdale, Missouri, was named Reserve Grand Champion. Following the completion of the junior show, Cam Sparrow sorted the Open Show cattle. The Grand Champion Female was awarded to David and Annette Bonacker of Cedar Hill, Missouri, and Jaid Runft of Scandia, Kansas, took home the title of Reserve Grand Champion Female. Next, Sparrow selected the Grand Champion Bull, GJL Ruidoso 3082 owned by MSL Cattle Company of Cameron, Texas, and JVS Cattle Company of Sulphur, Louisiana. The title of Reserve Grand Champion went to Bar S Rapid Fire 3859 owned by Grady Dickerson of Paradise, Kansas, Taylor Goering of McPherson, Kansas, and Bianchi Charolais of Gilroy, California. To follow the 2015 American Royal Livestock Show, like us on Facebook or follow the @AmericanRoyal on Twitter. For 2015 American Royal Livestock Show results, click here.